at Oviedo (Spain) on 17-18 of November 2016. "Barcelona Postgrad Encounters on Fundamental Physics" at the Faculty of Physics, University of Barcelona in 2012. "International Postgraduate Meeting on Fundamental Physics" at the Faculty of Physics, Universidad de Santiago de Compostela in 2014. "IV Postgraduate Meeting On Theoretical Physics" at the Instituto de Física Teórica de Madrid in 2015. 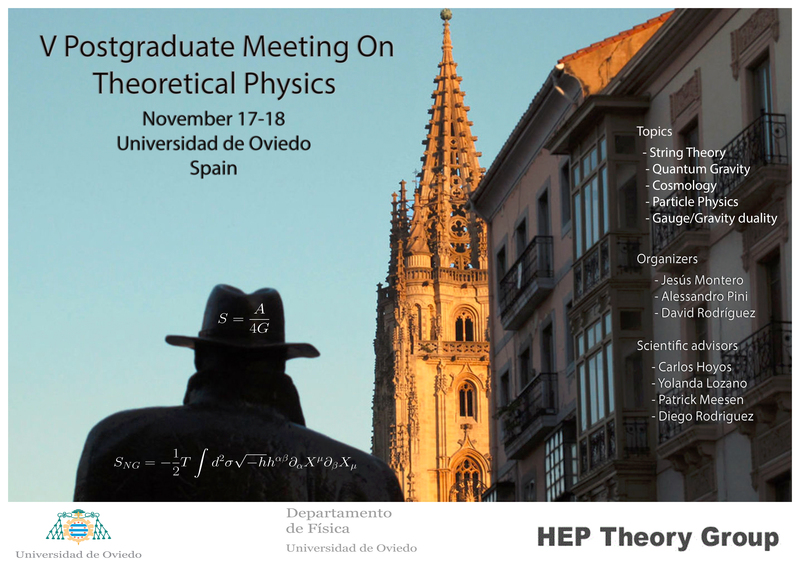 The aim of the meeting is to allow theoretical physics-oriented PhD students and young postdocs to illustrate their research projects in an informal environment and to establish collaborations among them. We strongly encourage young researchers to participate with a talk or a poster. The topics will span string theory, quantum gravity, quantum information, particle physics, gravitation, cosmology, integrability, high energy phenomenology and supersymmetry among others. There is not registration fee. Unfortunately we will not be able to provide financial support for travel or accommodation expenses.